The second anime attempt over SNK’s extremely popular Samurai Shodown fighting game franchise is without a doubt, a big step forward in every direction. The quality of story, graphics and fights has been greatly improved, compared to its predecessor Samurai Shodown The Motion Picture, and as much as some people were disappointed of Samurai Spirits 2, I find the product being quite good and enjoyable. Surely, it’s not the best out there, but it is still very decent. (Story and Plot) Probably the first thing that we should mention about the story is the fact that it is finally following the game’s original plot. Something that for what so ever reason, has been skipped in The Motion Picture. Still, what the show really caught me with, were not the action, or the hope for a minor explanation over a piece of the enormous franchise. It was the good mix of seriousness and tender humor. Focusing on inner conflicts incidental to every human being, the story concerns the difference between what is good and what bad, what you want to do and what you are obliged to, between easy and right, and the value and weight of your own choices. All of that has been shown trough Nakoruru and Rera, who are the two sides of one coin. The comic moments between Rimururu and Haomaru were another classy stroke that I will be remembering for a long time. Of course, the story has its amount of unclearness and plot holes, but they are not as visible, as they usually are in productions of that kind. Samurai Spirits 2’s biggest disadvantage of is that it has not been made for people who are unfamiliar with the games and lack some decent knowledge on the characters. Someone not familiar with the franchise will probably have a hard time understanding the value of this show. (Art and Music) Art and music are probably bringing the biggest improvement to Samurai Spirits 2, compared to its prequel. Drawn in that typical style of the 90’s, with perfectly designed, detailed characters and marvelous landscapes, it really manages to get you in the samurai world. The fight scenes were pretty good, with nice choreography and also drawn with details. The music was awesome, perfectly completing the theme and mood of the show. I rarely comment the voice acting, but I must say that the performance of those who voiced Haomaru and Rimururu was a class. (Charachters) A good thing about the characters is that only few of them are under the spotlights in these OVA episodes. This allows us to focus on their development, their personality, their problems and we can actually see someone behind our favorites. 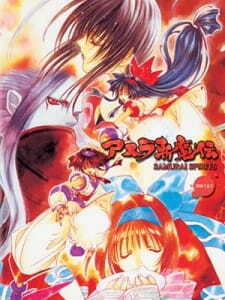 The anime mainly focuses on the four - Nakoruru, Rera, Rimururu and, Haomaru, leaving the others like Shiki, Garfold and the bad guy, with little time on screen and literally useless background role . (Overall) Samurai Spirits 2 is a definite must see for all the fans of the series, for it gives a view over the personality of some of our favorite characters. It made quite positive impression on me, as I believe it would make to anyone who looks a little bit under the floor. So, I will not tell anyone, who never played the games to stay away from it, after all it’s not a bad piece of drawing. I had high expectations for Samurai Spirits 2 aka Samurai Shodown 2 being a super fan of the arcade games. Well, it just shows that a great story (as far as fighting video games is concerned) in the hands of the wrong people just turns into a pile of rubbish. I was not expecting Street Fighter quality, but something at least as Fatal Fury. It is equal or worse than Art of Fighting anime... I won't waste time describing what went wrong about this anime, because EVERYTHING is wrong. Avoid at all costs.